Approx Bang 10". Cap Size Petite. The lighting you view your wig in may be different from lighting used in photos. Our photos are taken outside in good bright lighting so colors may be more intense. 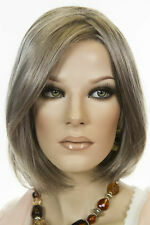 JON RENAU SYNTHETIC WIG - SMART LACE COLLECTION. MODEL: KRISTEN. Unparalleled Comfort and Realism - Each individual hair is hand-tied to the lace, creating the illusion that the hair is growing from your own hairline. 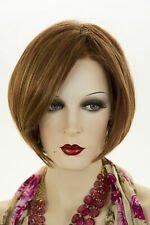 HAUTE SMART LACE FRONT MONOPART WIG BY RENAU. THE JON RENAU HD (HEAT DEFIANT) COLLECTION FEATURES COLLECTION : HEAT DEFIANT COLLECTION BY JON RENAU. The lighting you view your wig in may be different from lighting used in photos. Combining the cooling ventilation benefit of an open cap and the natural hair growth look of a lace front, Kristen scores high in comfort and style. The face framing bob has never looked this chic! The lighting you view your wig in may be different from lighting used in photos. Nita is a modern twist on the classic bob. No tape or glue needed!SPECIFICATIONSLength B 7" C 7.25" S 5" N 2.75"Collection SmartLaceCap Construction Lace Front / Open CapCap Size PetiteHair Type SyntheticWeight 2.7 oz. Color Ash Brown 75% Grey Front & Brown 35% Grey Nape - 39F38. Jon Renau Kristen! This chic, face framing bob scores high in style and comfort. Venice Blonde - 22F16S8 Soft Black w/ 33% Golden Red Highlights - 1BRH30 Lt Ash Blonde & Lt Nat Blonde Nat Blonde Nape - 22F16. 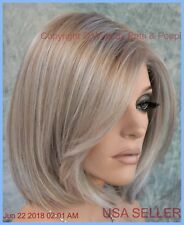 RUBY Wig by JON RENAU Color #38 Grey Smart Lace Front, NEW! Once your hair is nice and safely tucked away, you're ready to apply your new wig! Starting at the front of your wig, place the front of the wig against your forehead and slide the wig back and down over the back of your head ?. From the SmartLace Wigs Collection. The realism and styling options of a transparent thin lace hairline along the front of the cap allows for styling the hair off the face. The mono cap construction at the top simulates a natural scalp and simulated hair growth for multi-directional styling. Color Lt Brown W/ 33% Lt Natural Blonde Highlights - 10RH16. Jon Renau Kristen! This chic, face framing bob scores high in style and comfort. Venice Blonde - 22F16S8 Soft Black w/ 33% Golden Red Highlights - 1BRH30 Lt Ash Blonde & Lt Nat Blonde Nat Blonde Nape - 22F16. Kaley by Jon Renau Fall 2016 Collection Synthetic Wigs. Once your hair is nice and safely tucked away, you're ready to apply your new wig! Starting at the front of your wig, place the front of the wig against your forehead and slide the wig back and down over the back of your head ?. Color Amber / Cream Soda - 27MB. Jon Renau Kristen! This chic, face framing bob scores high in style and comfort. Soft Black w/ 33% Golden Red Highlights - 1BRH30 Lt Ash Blonde & Lt Nat Blonde Nat Blonde Nape - 22F16. Jon Renau Kristen! This chic, face framing bob scores high in style and comfort. To freshen- up your wig between shampoos, you may use a fabric spray like Febreze. Amber / Cream Soda - 27MB Chestnut Brown - 6 Light Butterscotch Light Ash Brown Tipped - 24BT18. This is one of the BEST new tones to hit our range this season! Then the roots are a dark brown gradient (regrowth appearance) for an undetectably natural color mix! When placed on your head, the hair looks like its growing out of your very own skin! No tape or glue needed!SPECIFICATIONSLength B 4.75" C 7" S 4.75" N 3.25"Collection SmartLaceCap Construction Lace Front / Open CapCap Size AverageHair Type SyntheticWeight 2.5 oz. To freshen- up your wig between shampoos, you may use a fabric spray like Febreze. At once smoldering and sophisticated, this long layered style embodies modern femininity. Jon Renau - Courtney. This is one of the BEST new tones to hit our range this season! Then the roots are a dark brown gradient (regrowth appearance) for an undetectably natural color mix! JON RENAU VICTORIA +FREE WIG CAP, SHAMPOO, CONDITIONER & BRUSH RETAIL VALUE $30! Color Lt Auburn/Lt Ginger/Mid Auburn/Pale Blonde - FS27. To freshen- up your wig between shampoos, you may use a fabric spray like Febreze. Golden Blonde w/ Pale Golden Blonde Bold Highlight - FS613/24B. Golden Blonde w/ Pale Golden Blonde Bold Highlight - FS613/24B. To freshen- up your wig between shampoos, you may use a fabric spray like Febreze. Gold Blonde/ Lt. Strawberry/Auburn - FS26/31. Light Gold Brown with Gold Blonde Bold Highlights - FS12/24B. Ash Blonde Red Golden Blonde Shaded Lt Brown - 14/26S10. Ash Blonde & Golden Blonde Blend Shaded Brown - 24BT18S8. To freshen- up your wig between shampoos, you may use a fabric spray like Febreze. Lt Auburn/Lt Ginger/Mid Auburn/Pale Blonde - FS27. Color Ash Blonde & Golden Blonde Blend Shaded Brown - 24BT18S8. To freshen- up your wig between shampoos, you may use a fabric spray like Febreze. Never brush your wig while it’s wet! ash Blonde Red Golden Blonde Shaded Lt Brown - 14/26S10. To freshen- up your wig between shampoos, you may use a fabric spray like Febreze. Color Light Gold Brown with Gold Blonde Bold Highlights - FS12/24B. Lt Auburn/Lt Ginger/Mid Auburn/Pale Blonde - FS27. Gold Blonde/ Lt. Strawberry/Auburn - FS26/31 Black - 1. To freshen- up your wig between shampoos, you may use a fabric spray like Febreze. Golden Blonde w/ Pale Golden Blonde Bold Highlight - FS613/24B. 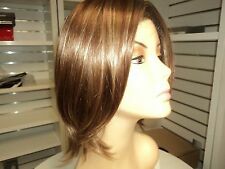 The latest addition to our heat resistant wig collection! Once your hair is nice and safely tucked away, you're ready to apply your new wig! Starting at the front of your wig, place the front of the wig against your forehead and slide the wig back and down over the back of your head ?. Golden Blonde w/ Pale Golden Blonde Bold Highlight - FS613/24B. To freshen- up your wig between shampoos, you may use a fabric spray like Febreze. Color Light Brown with Blonde Bold Highlights - FS10/16. Color Malibu Blonde - 12FS12. Lt Auburn/Lt Ginger/Mid Auburn/Pale Blonde - FS27 Chocolate Cherry - FS2V/31V Ash Blonde & Golden Blonde Blend Shaded Brown - 24BT18S8 ash Blonde Red Golden Blonde Shaded Lt Brown - 14/26S10. Lt Auburn/Lt Ginger/Mid Auburn/Pale Blonde - FS27 Chocolate Cherry - FS2V/31V Ash Blonde & Golden Blonde Blend Shaded Brown - 24BT18S8 ash Blonde Red Golden Blonde Shaded Lt Brown - 14/26S10. To freshen- up your wig between shampoos, you may use a fabric spray like Febreze. Ash Blonde Red Golden Blonde Shaded Lt Brown - 14/26S10. To freshen- up your wig between shampoos, you may use a fabric spray like Febreze. Ash Blonde & Golden Blonde Blend Shaded Brown - 24BT18S8. Lt Auburn/Lt Ginger/Mid Auburn/Pale Blonde - FS27. No tape or glue necessary! NEW SIZE IN HILLARY. The lighting you view your wig in may be different from lighting used in photos. Our photos are taken outside in good bright lighting so colors may be more intense.